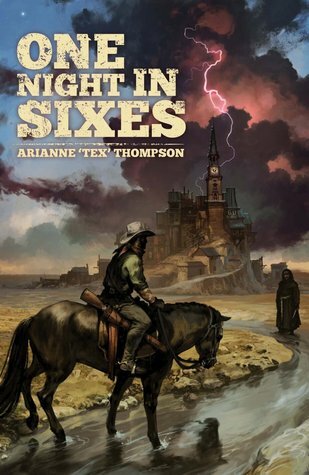 One Night in Sixes is a fantasy Wild West novel. I haven't read many of those - The Incorruptibles and Red Country are the ones that spring to mind - but I'm told it's a growing genre. The novel starts at an annual market / fair, where Sil, one of our two protagonists, is failing to sell the horses he's been sent to sell. It's his first year in charge, and bar an early sale weeks ago, he has failed dismally. Appaloosa Elim is a more experienced, but less eloquent guy. His job is to look after the horses, while Sil is basically the manager. When the fair ends and they still have almost all the horses they arrived with, Sil decides to head across the river / border, into the hostile country beyond the frontier, to sell the horses there at a premium. Elim objects - but when Sil rides ahead, Elim is forced to follow, for he wouldn't dare return without Sil, just as Sil would not dare return without Elim. The novel is a struggle to read. It throws you right into a complicated universe without any preamble or context, without exposition and without any patience. Ultimately, you find out that the different tribes are all part-magical, with powers linked to the animal they are affiliated with. So the ravens/crows are sneaky and try to be clever, the fish people can breathe under water, the Northerners / palest of white people can draw heat from objects and turn them cold, etc. etc. etc. There's been a war in living memory, and all the "mules" are presumed to be the outcome of rapes committed during the war, hated and scorned for that reason. Each tribe has different beliefs and rites, and all the natives / Injuns live in one joint territory, only barely at peace with each other, while the cowboys and whites have the rest of the country. All of which could be a vaguely interesting premise, but the book falls very flat. Too many characters with too many names, too many tribes with too many motivations. While the author seems to have worked out motivations for each character (I think), none have been imbued with much personality to speak of. They all feel like cyphers - each tribe meant to have one or two characteristics, so each member of each tribe has those characteristics. This book made me realise how fundamentally racist fantasy fiction can be: when a person's tribe / race determines every aspect of their personality, without much room for individual traits, then the society being described is fundamentally racist, not just in characters' beliefs, but in actual fact - racism is justified when race determines everything about a person. The "throw your readers in at the deep end" approach can be effective (pretty much every China Mieville novel does that), but in this case, it obstructs the reading. A huge portion of the book takes place on a day when one character is tied to a post and roasting in the sun, so for all that time, there is limited plot progress. And once the plot does move on, it's so confusing with so many people and so many different schemes intersecting that the complicated woven knots of Song of Ice and Fire seem simple and predictable in comparison. Even after reading the book, I have no idea why the Injuns are particularly keen on horses or horse people. Besides, with no character being particularly likeable (one protagonist has initiative but is an arrogant fool, the other has no initiative at all and is entirely passive), this particular reader couldn't care less about what happened to any of them. The ending, meanwhile, is a non-ending, clearly setting up a sequel, so there's not even any particular satisfaction in getting to the end. I'll be honest, this review owes a lot to the discussion at our book club!